"Penny Lane" is a song by The Beatles, written by Paul McCartney. It was credited to Lennon–McCartney. Recorded during the Sgt. Pepper sessions, "Penny Lane" was released in February 1967 as one side of a double A-sided single, along with "Strawberry Fields Forever". Both songs were later included on the Magical Mystery Tour LP (1967). The single was the result of the record company wanting a new release after several months of no new Beatles releases. In 2004, Rolling Stone ranked "Penny Lane" at #449 on its list of the 500 Greatest Songs of All Time. 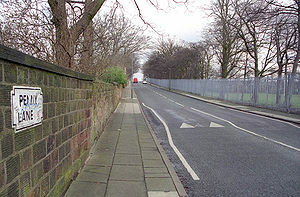 The song's title is derived from the name of a street near Lennon's house, in the band's hometown, Liverpool. McCartney and Lennon would meet at Penny Lane junction in the Mossley Hill area to catch a bus into the centre of the city. The area that surrounds its junction with Smithdown Road is also commonly called Penny Lane. At the time, in the 1960s, this was a significant bus terminus for several routes, and buses with "Penny Lane" displayed were common throughout Liverpool.